I did include this photo in yesterday’s Daily Photos, but I’d intended to save it for Wordless Wednesday. I like it so much, and I think Mimi likes it too, so I decided to use it anyway! No, I can’t see you! Basil must have thought the yellow basket was a gift for him because he owned it from the day it came into the house, which was the day I was running errands and saw it…atop someone’s trash pile. I sprayed it down and rinsed it in the basement and let it air dry, then brought it up to the magic basket spot, and Basil was immediately IN THE BASKET, looking totally cute, big, long, white whisker and all. Read more, and purchase. 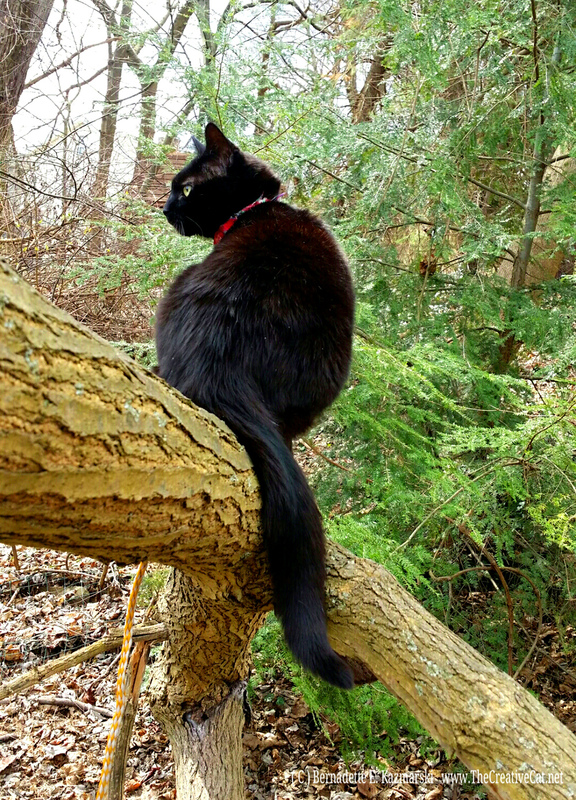 Love that tail curled around the tree branch. Perfect! That must have been a fun climb! You can get even closer to all of the birdies and squirrels that way. 🙂 There is something really beautiful about a cat surrounded by lush green scenery.